I have been making an effort to eat low carb recently. It is amazing how once you switch to this way of eating (and count carbs) how much hidden sugar there is in food. I have always been highly attached to carbs, but if I am honest, it is more that I am attached to sugar. Weaning myself off sugar has not been easy, I think for the simple psychological bond I have with it! We have been close companions for such a long time!!! :) My love of biscuits, cakes and sweets have always been my downfall and my desire to make these things is fuelled mainly by my desire to EAT them! I think eating has moved from something that is life giving to something that is pleasure giving and while I certainly don't think that food shouldn't be pleasurable, I definitely think, that in an effort to make people consume more, the marketing machines of food producers emphasise the pleasure aspect to get us to buy. After all, we don't generally need all the crap they are making do we? Certainly we don't need all the chemicals, preservatives and additives that make their way into so many processed foods and my feeling has been that it wouldn't hurt me to eat more in the way of 'whole' foods. I am not going to bore you with the ins and outs of eating low carb, however I have been pleasantly surprised at how satisfied I am eating this way. It is surprisingly easy, although it does require some effort with regard to everything needing cooking- there are few 'packet' options on this diet, just real food, cooked simply! 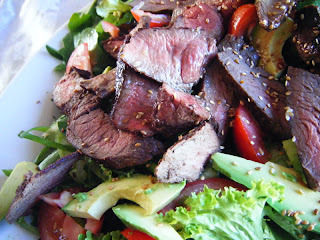 Steak- quantities depend on how many you are serving- I used rump but I often use sirloin too. I know I have been remiss in providing quantities but really this is a trial and error thing, and depends on your personal tastes and preferences. Just don't be too heavy handed with the sesame oil as it can be too overpowering. Cook the steak in a frypan or on the BBQ until medium rare. Let rest for about 5-10 mins. 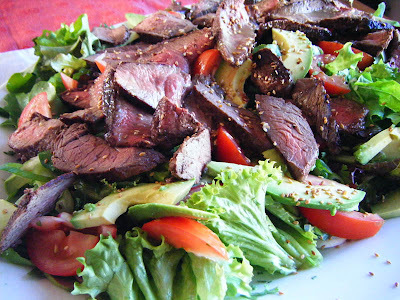 While it rests throw all your salad ingredients onto a large platter, slice the steak up and scatter over the salad, drizzle over the dressing and sprinkle with sesame seeds. I also made some noodles up for the carb eaters at the table- some egg noodles, cooked and tossed with sesame oil and more toasted sesame seeds makes a nice accompaniment. Hi Linda! Interesting reading and great recipe! I too am into lowcarb, ie no carb ;) LCHF. I feel so well now and it is not purely a method of loosing weight (even if I have). So many good sideeffects. I am also trying to avoid all the food preservatives and chemicals! Hi Linda, I'm reading your blog back -to -front at the mo, I'm really interested in your post as I'm going low carb soon- I'm not looking forward to weaning myself off carbs - I can really relate to what you said in your post. I gave up ciggies - I can kick carbs, lol. I can, I will.